Calstock boatyard. – Dirty wet dog , boats and sailing. 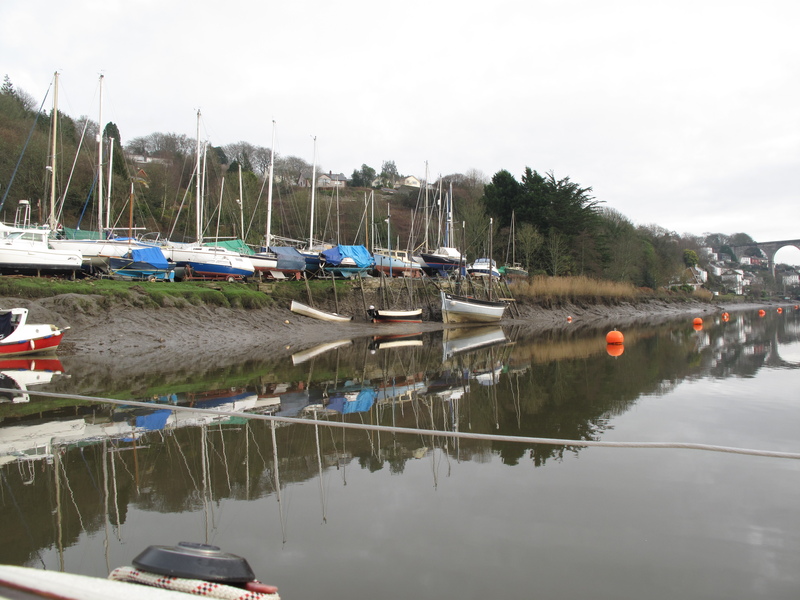 In my blog it was always my intention to write about boats, the people that sail them and the places that i find along the way and Calstock boatyard having been my base since i bought WABI”’ is the first place that i really wanted to cover in the blog. I had known that there was a boatyard here since i moved to another village nearby some 3 years ago and came across it when i was out exploring the area on foot one day : at that time i believe that it was in transition with one set of owners leaving and the current ones just taking over. When i bought the Liberty this was the obvious place to bring the boat as its all of 10 minutes drive from home. If you are in the area its worth dropping in as the welcome sign is over the door of the honesty cafe : come in, make a brew, have a piece of one of Julia’s most excellent cakes and drop some money in the box. This is certainly the nicest spot i have ever kept a boat and by far the friendliest : the yard is high up the Tamar river just short of the viaduct over the river at Calstock itself . If you ever want to do a scenic railway journey then jump on the train at Plymouth and you will cross that viaduct just before the train pulls into Calstock station, just across the river is a footpath along the Devon shore (the yard is in Cornwall so bring a passport). Chris and Julia’s lugger ‘Spirit of Mystery’ is usually alongside and up until i left for my cruise i nestled under her boomkin…we almost used it once to sway my new battery down with ! Ok so what’s it like ?. Well its a small and scruffy ‘do it yourself’ yard with absolutely no pretentions to being a posh yard. There is a shed and a muddy slipway and to lie alongside a boat has to sit in the thick gloopy Tamar mud. Chris does have a line of moorings in the river and if i have this right then he has recently acquired the right to manage the river moorings and to create some new parish mooring places (i hope to get one). Yard bosses Chris and Julia are both experienced long term cruisers, Chris i believe teaches maritime science at Plymouth Uni so he knows a thing or two about boats and seamanship. Downsides : getting down the lane from the ‘main’ road can be either hilarious or exasperating depending on what mood you are in and how bad the local driving and parking is that day (the village having an ‘alternative’ highway code) : when i had the Liberty transported here the very experienced transport driver could only just wriggle through the lane and that was only by using the pavement. It certainly not a yard for big boats although they did manage to accommodate a 40′ Freedom here last year. Parking is very limited which is unsurprising given the width of the lane and the amount of land the yard uses. We have just moved Mudbucket ( Well that is what No1 son calls her… he is no seaman being a marine biologist spends his time under the water!) with her kelp forest and mobile mussel bed onto a mooring at Calstock. Think I will get a smaller motorbike to get there on!! The little yacht is called Whisper of Plymouth… a 1968 Hurley 22, I have owned her since 1998 and she is in need of a good overhaul! I actually met the guy who bought the hull from Hurley and built all the superstructure etc… she was in a cradle in the old boatyard down by Turnchapel… by the rustbucket dredger TERSCHILLING.. can not remember the name of the original owner or the yard ( except the yard owner ? Mr Bosham… had a magnificent beard and swore quite a lot! Sailed up and down on a day basis around the sound and East and West…. but my sailing buddy Robin passed away suddenly about 7 years ago and I have not used her so much since ( was on SaltashCC mooring… but I never got “invited ” to take her onto the hard there for overwintering. Calstock is closer to me as I live and work around Harrowbarrow ( Beefarming)… will either be theer at the boatyard in GOKI ( means fool in Cornish) my old red 110 Land Rover.. or on one of my various motorcycles! I could crack open a bottle of mead! !